Live feed is the detailed view of customer activity on the site, illustrating pageviews and browsing sessions on the site. Summary on the top of the page (green rectangle) displays the overall summary and stats. Carts is the number of shopping carts and products a sum of products in carts, whereas potential revenue is the sum of how much sales would you make, if all carts and products in them were bought. 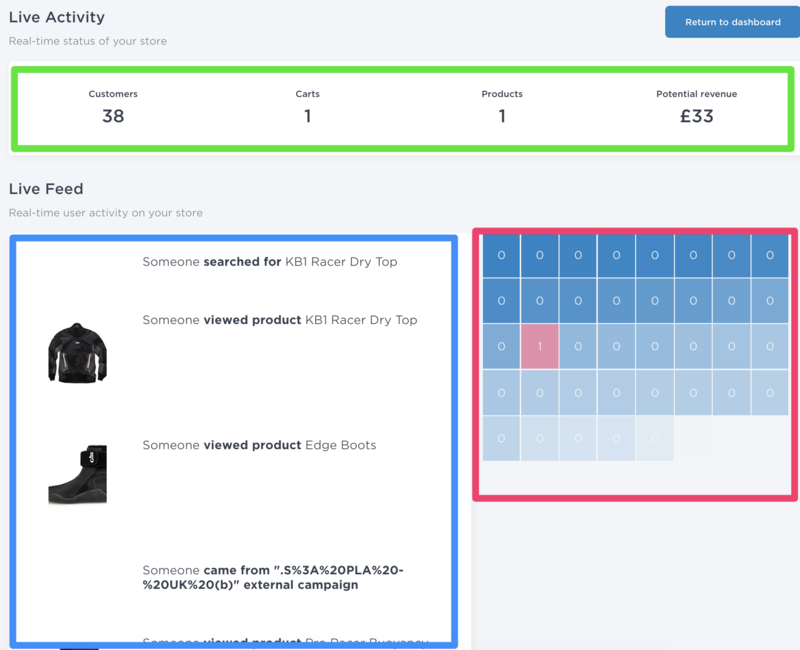 Feed on the left (blue rectangle) is the product feed, illustrating products (product pages) being viewed and also reveals other actions visitors do on the site such as search terms used, conversions and customers landing to the site from a campaign. Feed on the right (red rectangle) is the visitor summary displaying all active sessions. Note that active session time for Nosto is 30 minutes, whereas for Google this is typically five minutes. 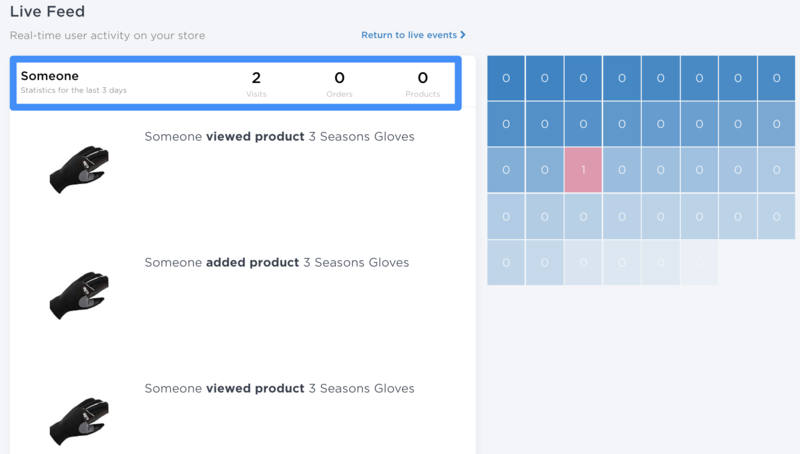 Blue icons illustrate visitors who are just browsing products, whereas red ones represent active shoppers with products in their cart. The number is the total number of products currently in the cart. A dimmed icon illustrates an inactive session: A visitor who hasn’t loaded any pages for a while and is about to drop out, possibly a user who has left the site. Clear icon is an active visitor who is actively loading pages. Clicking a session on the right opens up a visitor summary, which also displays the name of the person, if a visitor is identified by Nosto including visitor history (blue rectangle).